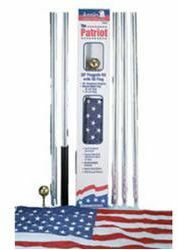 20' Aluminum Flag Pole Set with 3'x5' Poly-Cotton U.S. Flag. Set features 2" Satin Finish Aluminum Pole and 3' x 5' Poly-Cotton Flag with Sewn Stripes and Embroidered Stars. Furnished Complete with Ground Box, Cleat, Aluminum Truck with Gold Ball Cap, and Halyard.